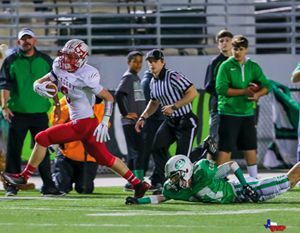 The Crosby Cougars licked the Brenham Cubs 38 to 20, one point off of their over by 19 points average in the playoffs, at Woodforest Stadium in Conroe last Saturday. Not since the Crosby Buffalos went to the 1960 State Championship playoff has the local team been so prosperous, and never in the history of Crosby football has any team sported a 12-1 going into the Class5A Division II Quarterfinals. It is doubtful that back then the stands would be packed with Crosby fans wearing team colors as was the case Saturday. The elephant in the room here is that the Cougars are getting better in the post season. The offense is blocking for their teammates, when a runner is smacked by the defenders, he rolls off and just keeps pumping for extra yards. That happened not once or twice but throughout the game. The defense is learning to pick apart the oppositions offense. When Crosby played C.E. King (their only loss,) a wee halfback was running through the line like a greased pig. Well, Brenham had an equally adept running back, E. Patterson, who amassed 172 yards on 23 dashes and caught 3 for 13 yards. But when you saw him fall before reaching the scrimmage line in the third quarter and getting tackled right after getting the hand off in the fourth quarter, it was going to be a Cougar victory. Teammates aiding Joseph Pickney with blocks on the run back after the interception showed versatility in the third quarter. Crosby scored on their first drive, there are four potential receivers this year. Tristen Cotton would connect with eleven of sixteen passes. Cotton made 10 for 37 yards wise keepers. The Brenham Cubs would come back for a counter score on even fewer downs late in the first quarter. Crosby would answer that with a touchdown after a few minutes in the second quarter on a pass to Vernon Allen. It was about this time that the Brenham team began to notice a problem converting the third down. They were forced to kick a field goal two minutes later. The third quarter was burst when Carlos Grace made the 45 yard run to the touchdown. There was three minutes left when Brenham had to settle for another field goal and just before the end of the quarter, Crosby would get a field goal of their own. To their credit, Brenham made a touchdown after the half, it burned up five minutes and a time out though. Following a series of outstanding plays Crosby got great position from receivers like Larkin (averaging 11 yards a catch) and Vernon Allen (averaging 7.2 yards a catch,) Carlos Grace would fly through the line for a final touchdown. Crosby goes to stand against the Hutto Hippos at 2:00 p.m. Saturday at San Marcos Bobcat Stadium. The brown uniformed Hippos were coming in from a 48 to 0 win over McCallum until last week they encounter Angleton and squeaked by 21 to 16. They are averaging 39.8 points per game. Their overall record is 11-2 but Crosby is 12-1. Both Cougars Carlos Grace and DOntal Allen have 19 touchdowns and both have averaged about 100 yards per game. Tristen Cotton has 266 pass attempts that made 21 touchdowns but 2 interceptions have been returned. Craig Williams has a 90 yard kick off return. Hutto comes into the game with 518 points but Crosbys defense has not given up more than 24 points in a game. Crosby can win this if their defense holds to their pattern of shutting down their opponents offensive by learning their weeknesses.